Here is a great alternative to the classic burger if you are trying to stay low-carb or follow a Paleo or ketogenic lifestyle. Still very easy to make and enjoy and perfect for the weekend. Divide the mixture into 6 sections, and roll each piece into a ball then press down flat for 6 burgers. you can also use a burger press if you have one. Place each burger on your grill/pan and cook for approximately 304 minutes on each side. Try not to press down on the burgers...they end up a little dry that way. Once you flip the burger, add your cheese to the top cooked side. In a small bowl mix together the spread ingredients and refrigerate. Once you have cooked all your burgers and removed them from the pan, assemble them. 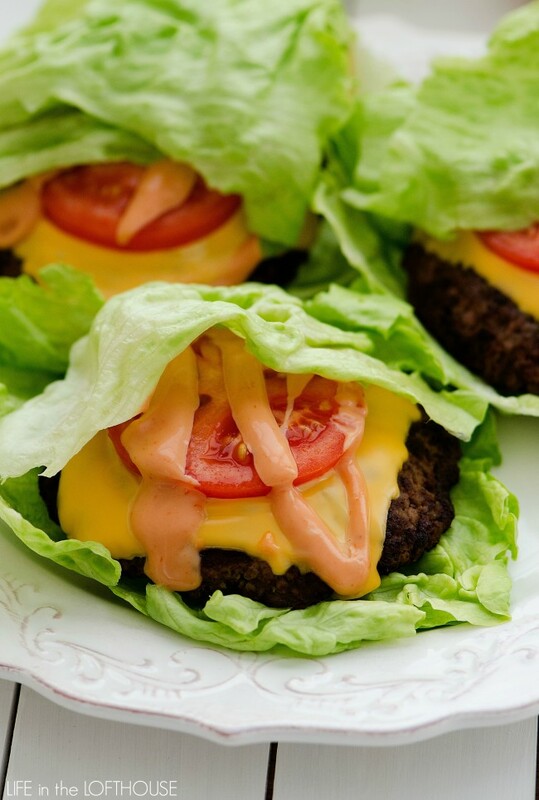 Place 1 cheeseburger on the lettuce leaf, top with 2 slices of tomato, a spoonful of spread, then wrap top to bottom with another lettuce leaf.